If you want to upload a lot of documents to Google Docs, it's difficult to upload them one by one. You can send the documents by email, but this option is not very reliable and not all the formats are supported. Google Docs has an API that lets you upload, download and edit documents, but there aren't many applications that use it. One of these applications is Google Docs Batch Upload, developed by Anton Beloglazov. It's a command-line Java application, so it should work in Windows, Mac, Linux, as long as you have JRE 1.6. In other news, documents will not be editable from 12:00 to 1:30 pm PST, according to the Google Apps Status Dashboard. we want google drive and the new docs interface!!!! What we could do with is a drag and drop interface. 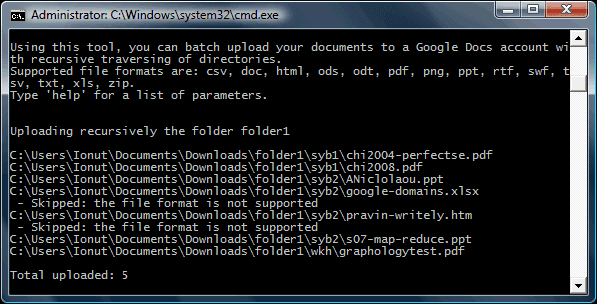 Command-line isn't a user-friendly interface, but you won't upload multiple files to Google Docs very often. A sync tool would be useful, but it will probably be available when Google Drive is released. why won't docs be available today? anything to do with google drive? what about the new interface? Thanks for sharing great information. I am very passionate aboutupload and that's what my site speaks about. I would look ahead to be coming to this site time and again to gian more tips. I am still a novice so couldn't really compete to comment with other guys here. I am interested in the Google Drive too. In the meanwhile, I am using the free Gladinet tool (http://www.gladinet.com) to map Google Docs as a virtual drive in Windows Explorer. I can drag and drop file both ways (upload/download). It works well for me. I havn't tried the latest Glaidnet feature to backup my Google Apps's google docs to my other personal google docs account yet. @Kevin McFarlane: If you use Google Desktop, you can install the Google Docs gadget which would let you drag and drop documents into Google Docs (through the gadget). That's worked well for me. However, I've had some issues when PDFs were among the documents I was trying to drag and drop. It's possible they might have fixed that issue by now though. Thank you for writing about my tool. I've updated the list of supported formats, now it includes: csv, doc, docx, html, htm, ods, odt, pdf, ppt, pps, rtf, sxw, tsv, tab, txt, xls, xlsx. So docx, xlsx and some others are also supported. I'm also going to add an ability to recreate the folder structure. Command-line is great because we can then do all sorts of scripts to automate a ton of processes! I must say, http://www.gladinet.com is pretty awesome. It's pretty much the way to go... now if i could find an unlimited free version or something like it. Thats Quite Good Option!! But If any error occurs how the user can be notified!! Try to put your username including the domain name. Note: upper and lower case letters are different. Why don't they provide a simple app to mass transfer local files to Docs? Folder structure alone is already a hassle. Google provides an API that could be used to build an application for uploading files to Google Docs. Like this one. We're using the beta of the Linux Drive from SMEStorage.com on Ubuntu. It works pretty well and enables me to view /upload files to my Google Docs account as a virtual drive. They also advertise a windows virtual drive with some other windows tooling. Nice to know this is still around, but is there realy any need for something like this after google added folder upload to docs?